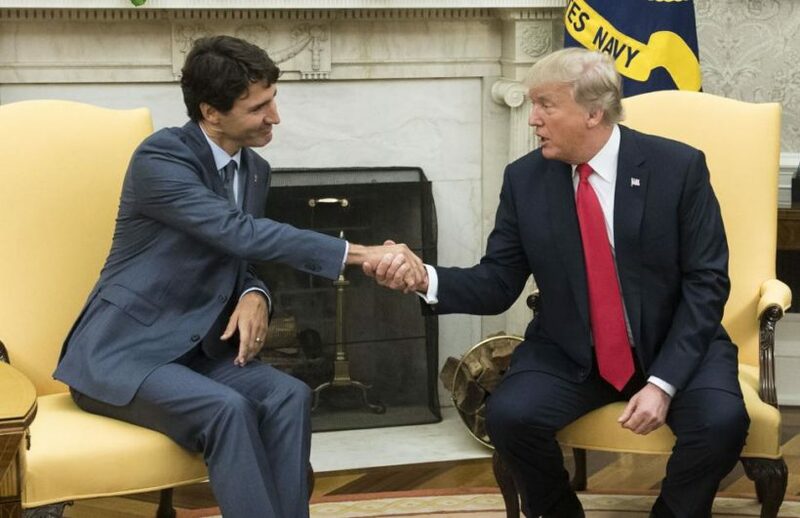 President Donald Trump shakes hands with Canadian Prime Minister Justin Trudeau during a meeting at the White House last year. 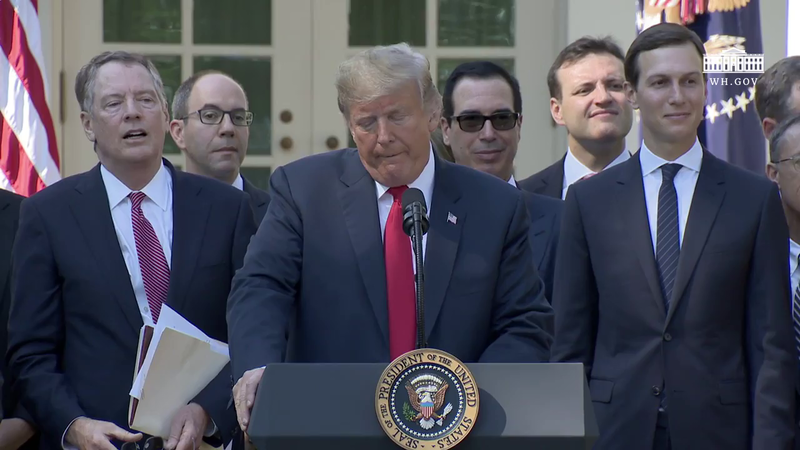 On Sunday, trade representatives from both countries agreed to a new trade deal to replace the North American Free Trade Agreement. (by Nicholas Sakelaris, UPI) — A historic new trade agreement with Canada represents a “new dawn for the American auto industry” that will transform the United States back into a “manufacturing powerhouse,” President Donald Trump said Monday. The $1.2 trillion trade agreement replaces NAFTA (the North American Free Trade Agreement), which Trump promised to repeal during his presidential campaign. 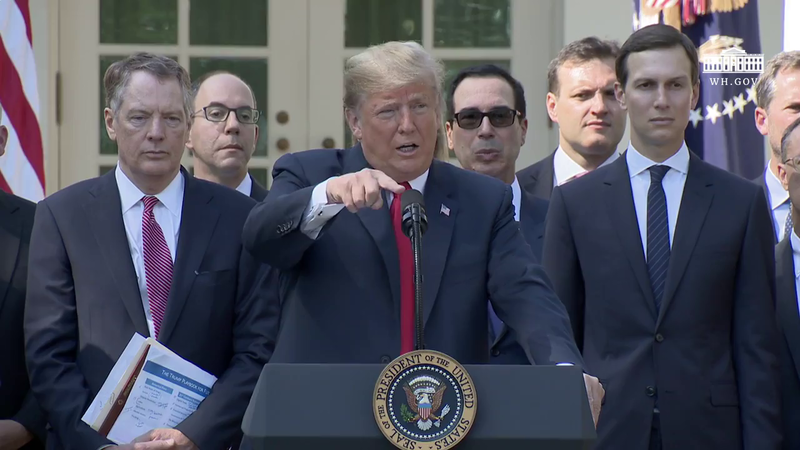 The new agreement was reached before Sunday’s midnight deadline and will incorporate the United States’ trade deal with Mexico that was reached in August. Trump coined a new name for the trade deal: United States-Mexico-Canada Agreement (USMCA). The replacement for NAFTA includes new provisions on digital trade and intellectual property. 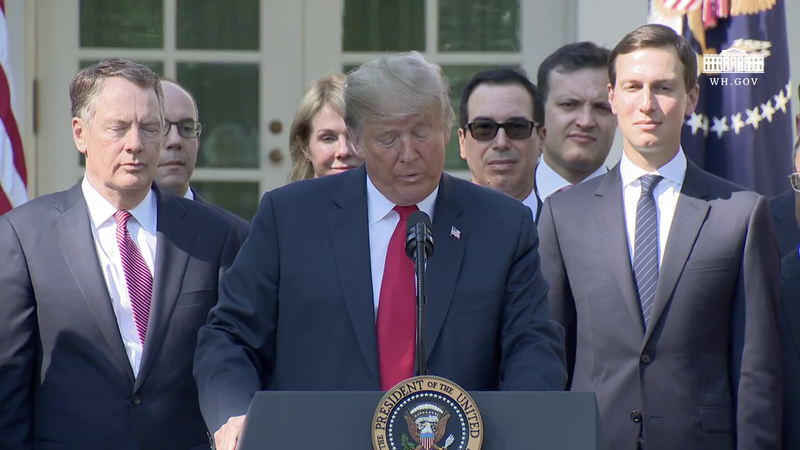 The agreement will benefit farmers, ranchers and automobile workers, Trump said. Under the agreement, 75 percent of every automobile must be built in North America. The auto industry in particular, which was hit hard by NAFTA, will see the biggest benefit. “We will be manufacturing many more cars,” Trump said. “Our companies won’t be leaving the United States, firing their workers and building their cars elsewhere. There’s no longer that incentive.” . [“For example, we [will] require a large portion of every car to be made by high-wage workers, which will greatly reduce foreign outsourcing which was tremendous problem,” he said. “More automobiles and parts will be manufactured inside the United States. We will be manufacturing many more cars and our companies won’t be leaving the United States, firing their workers and building their cars elsewhere.”]. The threat of tariffs has brought India to the negotiating table and Trump said he’s confident other countries, too. The USMCA is regarded by some a big policy win for Trump and Republicans heading into the Nov. 6 midterm elections. It’s unclear how long it will take to ratify the deal, since the U.S., Mexican and Canadian governments must approve it. 1. How did President Trump describe the new trade agreement he introduced in a press conference on Monday? 2. a) What is the name of the new trade deal the Trump administration signed with Canada? b) What trade deal does it replace? c) Name the third country that is a partner in this deal. 3. How much is the trade agreement the Trump administration made with the two countries worth? 4. President Trump has used the slogan “Promises Made. Promises kept.” What campaign promise does the U.S.-Mexico-Canada trade deal fulfill? 5. 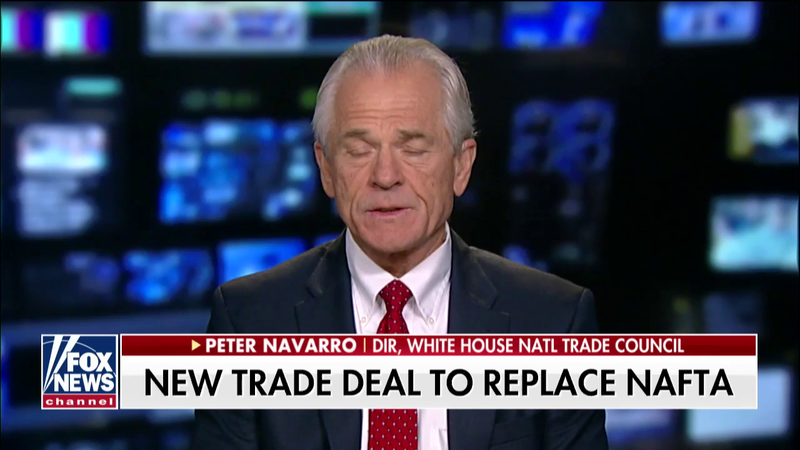 Peter Navarro is an economist and the Director of the White House National Trade Council. Watch the clip from an interview with Mr. Navarro (under “Resources” below). What is the tone of Mr. Navarro’s responses? 6. Free, fair and reciprocal trade relations are a key component of the President’s strategy to promote American prosperity. Define reciprocity and reciprocal. CHALLENGE: In addition to reading a news report on an event, it is important to watch the original event to see what the person actually says him/herself. Especially in the case of President Trump. Critics warned that he would cause a lot of problems by imposing tariffs on our allies and close trading partners. There are few/no major media reports that provide positive reporting on this historic accomplishment that many Democrats also support. 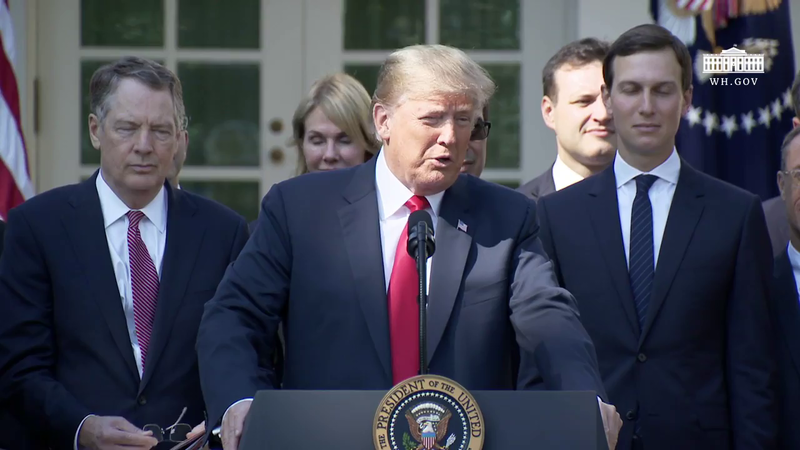 Watch the 4 video clips from President Trump discussing the USMCA trade deal and answer the following questions. a) For VIDEO #1: On what principle does the president say the trade agreement is based? b) For VIDEO #1: List the people President Trump credits for making the trade agreement happen. c) FOR VIDEO #2: The trade deal will ensure strong news protections for what 3 areas? d) FOR VIDEO #2: Who benefits from the signing of this trade deal? e) FOR VIDEO #3: What does President Trump say about his relationship with Prime Minister Trudeau of Canada? f) FOR VIDEO #3: How did he explain tariffs and the U.S. trade deal with China? g) FOR VIDEO #4: What does the president say about trade and tariffs with India – and about Prime Minister Modi of India? The Office of the United States Trade Representative (USTR) is the government agency responsible for developing and recommending U.S. trade policy to the President, conducting trade negotiations at bilateral and multilateral levels, and coordinating trade policy within the government. The USTR is part of the Executive Office of the President. President Trump’s U.S. Trade Representative is Ambassador Robert Lighthizer, who was confirmed by the Senate in May 2017. President Trump’s campaign provides a website, PromisesKept.com, that details the promises he has fulfilled while in office.